The tradition of hand-made pipes in Recanti, Italy dates to the 1850's. Hully Briars, employing 40 workers, was already well established during the 1900's. Igino Moretti and his wife joined Hully Briars when at its peak, employing about 50 workers. Half the pipe production was destined to a third party, while the other half was sold under the name BEP-SON, a combination of the first syllables of both owners' names: Beppe and Sonia. 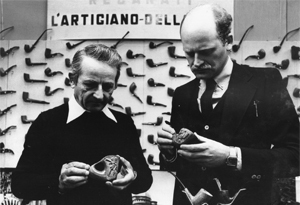 Soon after, Igino Moretti became the principal Hully Briar pipe maker, but the company itself had to close down. Having passed a railroad test, Igino Moretti then had to choose between driving trains and making pipes. Thankfully, the latter was he choice and consequently, Igino Moretti founded the brand "Moretti Recanti" in April 1968. During his first years, Igino Moretti continued to produce pipes for others and started his own line carrying the name Moretti. Today, Marco Biagini, Igino Moretti's son-in-law, continues the hand-made tradition based on the teachings of the founder. For the pipe smoking world traveler, Moretti pipes are still made in the small town of Recanati, in the Marche region of Italy. In fact, Pipe Moretti's workshop is located across the street from the house where the famous Italian poet, Giacomo Leopardi, was born. Today Pipe Moretti is famous all over the world. Each pipe is meticulously fashioned by hand using Calabrian Briar seasoned for at last 10 years, Olive Wood or Irish Bog Oak (Morta) seasoned for 6000-8000 years. At Pipe Moretti only the top quality materials are used for provide the best satisfaction and smoking experience to everyone. 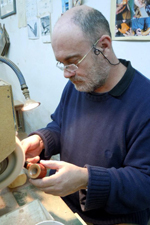 Many custom pipes are created as well based on the preferences of the friends of Pipe Moretti. Unlike most of the so called "hand-made" available today, a Moretti pipe is completely hand done by a true artisan with no elaborate machinery. For example, Marco holds the piece of briar in his hand while boring the tobacco chamber, and the same with the shank bore. The process is rewarding but very demanding. An important feature which distinguishes Moretti pipes is the fact that all the colors used on all pipes are 100% natural, no chemicals are used to color them. What does Marco do with briar pieces that have too many visible sandpits and defects? He simply discards them, and doesn't save them to make rusticated pipes. Normally such pieces would be sandblasted or rusticated by other pipe makers, but not at Pipe Moretti. Marco Biagini also produces unique straight-grained pipes: a great source of pride for both the artisan and the lucky pipe smoker and collector who owns one. Marco is very happy with his pipe making philosophy, which is unlikely to change after years of pipe-making history of professional and artistic satisfaction.